#51 on the last poll and #75 today. By now you’ve probably noticed that most of the books seem to have fallen on this poll. What’s supplanted them in the hearts and minds of readers? Oh. You will see. 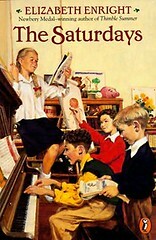 According to American Short-Story Writers Since World War II: Fifth Series, “Thimble Summer remained Enright’s most popular children’s book until 1941, when the first of the Melendy family stories, The Saturdays, was published.” I would dare say that it remains her best known work to this day (Newbery winner aside). For the interested, there are three other books in the Melendy series. The Four-Story Mistake (1942), Then There Were Five (1944), and Spiderweb For Two (1951). Rush slung his leg over the piano stool and sat down. With both hands he began to play slow deep chords that fitted together into a wonderful dark mysterious music. “Not an awful lot,” admitted Randy humbly. “Not many people your age do, though,” he added kindly. A touching inscription in one of Ms. Enright’s books by her son was discovered at Collecting Children’s Books. I’m happy to see far more book jackets for this title out these days. Splendid! This was the one book on the last list that I thought I’d NEVER EVEN HEARD OF. * When I said so, one of my best friends went off on me that she’d been trying to get me to read this for YEARS (she’d just said “the Melendy books” though, which is why I didn’t recognize it) and I needed to STOP WHATEVER I WAS DOING AND READ IT NOW. So I did. And of course I loved it. The great things these countdowns inspire us to do! I always wondered if this title seems a bit more dated to current readers than others in the Melendy set? The Four Story Mistake and Spiderweb for Two were always my favorite of this series Our library did not have the latter, so I had to spend a hard earned quarter for an ILL to get to read it. 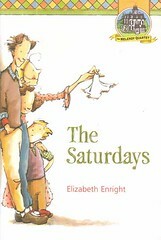 Enright was such a favorite that she was part of the inspiration for my daughter’s name. I recently rediscovered this series and fell hard – now I wish I’d voted for this one! I read all the Melendy books to my son when he was small. We particularly liked The Melendy Maze, but The Four Story MIstake was a lot of fun as well. Oops, the Melendy Maze might actually be Spiderweb for Two. Its the book in which the older Melendys send puzzles and clues to the younger two. I think my favorite part of this book was Rush going to the opera. I loved Wagner, too, and reading about a boy who didn’t think it at all “sissy” to go to the opera just made me so happy.